The Energizer Power Max P16K Pro smartphone is set to arrive at the MWC this weekend. It will feature a 16,000 mAh battery. Energizer has been quietly releasing smartphones in the past. In fact, a few made it to the Philippines courtesy of local computer retailer PC Express. The phones were mostly rugged with medium to large sized batteries. The one they are launching this time around will sport a monster 16,000 mAh battery. 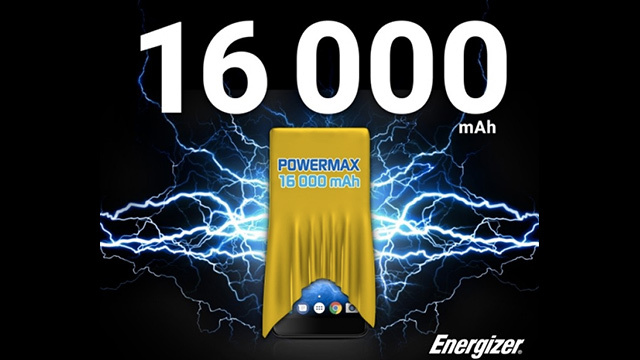 Set to launch at the MWC 2018, the Energizer Power Max P16K Pro is ready to blow the large battery smartphones out of the water with its 16,000 mAh capacity. It won’t be a one trick pony either. Aside from the battery, the rest of the phone’s specs aren’t that bad either. The Power Max P16K Pro will come with a 5.99-inch full HD display. It will be powered by a MediaTek Helio P25 processor, paired with 6GB of RAM and a generous 128GB of storage. The rear camera will use a dual 13MP + 5MP sensor setup, while the selfie camera uses an 8MP sensor. Energizer also claims the phone will use an “ultra slim” design, although it remains to be seen how this will happen given the monstrous battery capacity. Another thing we want to know is how long it takes to charge 16,000 mAh. The Energizer Power Max P16K Pro will officially launch on February 25 at the MWC 2018.